If you want your contents/quizzes to go viral, you have to carefully chose the right script/website. Because some of the website user interface is not carefully designed to go viral. In this post, I will share about my experience on viral websites and I will also share my recommendation for best viral website templates. Below images will show the difference between two viral websites. If you look carefully, you will see the difference. 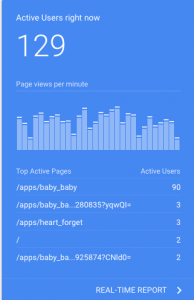 Don’t focus on the active user number, just focus on the “Top active pages” and Active users”. The top page from both websites are promoted by Facebook Ads. So that their active users is higher than other pages. But for the first image with active 216 users, active users for each pages are not too diverse. 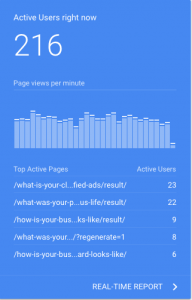 If you click on real time report, you will see that most of the pages have nearly equal number of active users. For second image with 129 active users, only the top pages have the highest number and other pages have only a few number around 2, 3 active users. And the Facebook Ads page has highest number of user. It also affects on the total active users. That why that first image total active users have much higher than the send image. (Actually the amount of money spending is higher in 2nd image). That’s why it is very important to choose the right script/website to success in viral project. Here are some scripts/websites I have tested and would like to recommend to you. The Number 1 and 2 are viral quiz website, the 3rd one is viral platform for news, images, videos and quizzes. Some of the script cannot change logo for our own brand. But all above scripts can change logo. So it is more convenient to use .